opposite happens! Months and even years after the accident, whiplash sufferers can experience symptoms they never had before, such as nervousness, irritability, depression, headaches, numbness, recurring aches and pains, etc. 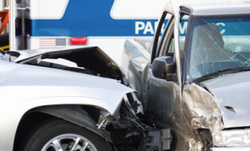 Soft tissue injuries due to a whiplash can result in the tearing of muscles and ligaments. This tearing interferes with the body's ability to straighten the structural damage. The healing of a spinal whiplash injury without proper professional care (chiropractic) would be somewhat like healing a broken bone without first setting it in place. If the whiplash injury does not receive proper physical care such as spinal adjustments, the body might mend the injured spine in a distorted position which can contribute to chronic and more severe problems in the future.